1. 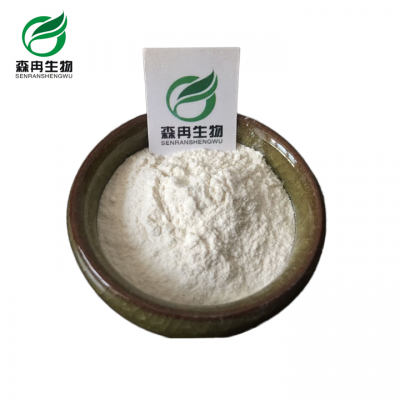 Glutathione (GSH) is a tripeptide that contains an unusual peptide linkage between the amine group of cysteine (which is attached by the normal peptide linkage to a glycine) and the carboxyl group of the glutamate side-chain. It is an antioxidant, preventing damage to important cellular components caused by reactive oxygen species such as free radicals and peroxides. 2. Thiol groups are reducing agents, existing at a concentration of approximately 5 mM in animal cells. Glutathione reduces disulfide bonds formed within cytoplasmic proteins to cysteines by serving as an electron donor. In the process, glutathione is converted to its oxidized form glutathione disulfide (GSSG), also called L(-)-Glutathione. 3. Glutathione is found almost exclusively in its reduced form, since the enzyme that reverts it from its oxidized form, glutathione reductase, is constitutively active and inducible upon oxidative stress. In fact, the ratio of reduced glutathione to oxidized glutathione within cells is often used as a measure of cellular toxicity. Under pathological conditions when endogenous GSH reduction, timely exogenous GSH has become to be. Exogenous GSH supplement can prevent and treat related diseases, maintain a healthy body. 1. Radiation sickness and radiation safety: radiation, radioactive substances or because of leukopenia caused by anticancer drugs and other symptoms can play a protective effect. 2. To protect the liver, detoxification, inactivation of hormones, and to promote bile acid metabolism and help absorb fat and fat-soluble vitamins digestive tract. 3. Anti-allergy, or inflammation caused by hypoxemia in patients with systemic or local, can reduce cell damage and promote repair. 4. To improve the course of certain diseases and symptoms as adjuvant drugs. Such as: hepatitis, hemolytic disease, and keratitis, cataract and retinal diseases, such as eye disease and improve vision. 5. Easy to speed up the metabolism of acids in the excretion of free radicals, which play a beauty skin care, anti-aging effect. 1.added to pasta, to make manufacturers reduce the time of bread to the original one-half or one third, and serve to strengthen the role of food nutrition and other features. 2 to add to the yogurt and baby food, the equivalent of vitamin C, can play a stabilizing agent. 3 in its mix to the surimi to prevent color deepened. 4 to the meat and cheese and other foods have enhanced the effect of flavor. Prevent the infiltration of Los tyrosinase in order to achieve the purpose of inhibiting melanin formation. On eliminate wrinkles, increase skin elasticity, shrink pores, lighten pigment, the body has an excellent whitening effect. Glutathione as the main ingredient in cosmetic products in Europe and the United States was welcomed by the decades.